When Emily Ditto and Tyler Carlin matched on Tinder, they had no idea that, a couple years after their initial conversations about their interests and puppies, they'd be engaged to be married. For their first date, Tyler picked up Emily for a pajama-clad adventure, and they drove to Virginia Beach. There, in the rain on the boardwalk, Tyler kissed her. Fast forward two years, and in the rain at Dave Matthew's vineyard, Blenheim Vineyard, while they were wandering through the grapevines, Tyler got down on one knee and asked Emily to be his wife. Tearing up, Emily immediately said yes. The "snowy winter wonderland" theme of the wedding added to the inviting nature of Emily and Tyler's special day, complete with custom-designed snowflake projections on the walls and a snowy sendoff at the end of the night. 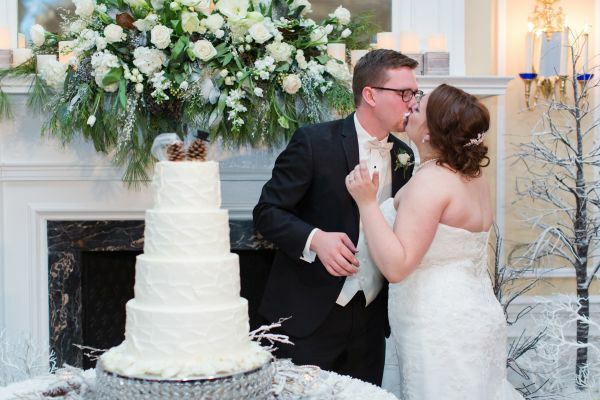 Even the cake went along with the wintry theme: it was reminiscent of a snowy mountain with red velvet to match the bridesmaids' dresses and two bride-and-groom pine cones on the top. Emily and Tyler's favorite part of the day was hearing the speeches given during the reception. "Hearing the love and support from both families was incredible," Emily says. 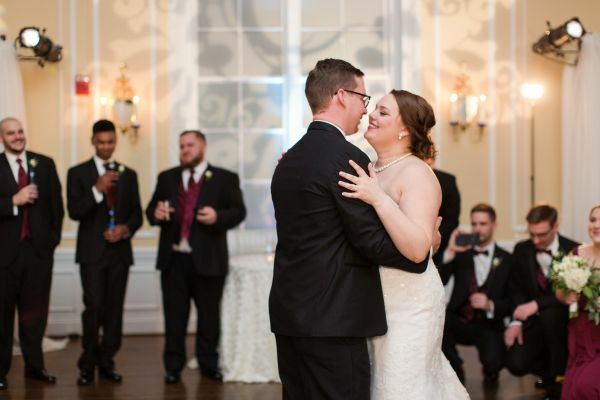 "On a day that was so rushed, it was a moment that allowed time to stand still and allowed for us to really reflect on what it meant that these two families would be joined forever." 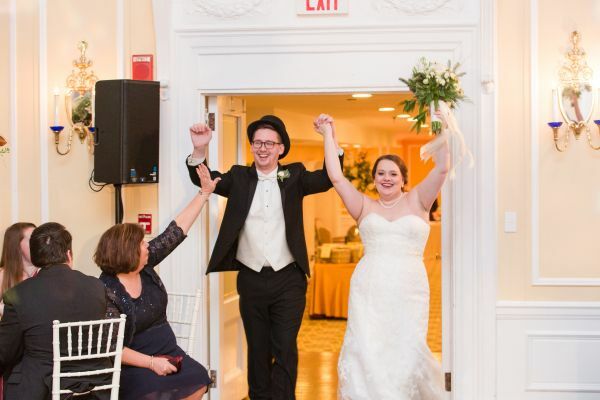 Adding a fun, unique flair, the couple incorporated a top hat into the wedding accents, as well as forgoing the traditional guest book for Christmas ornaments that wedding guests could sign. 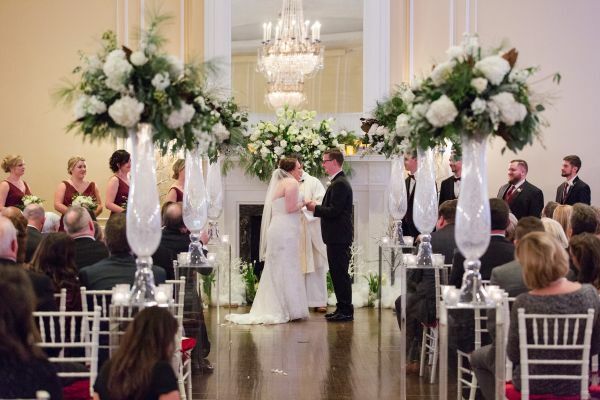 It was important to the couple to create the atmosphere of a Christmas wedding without going overboard, and the result was "romantic and intimate and loved by guests." 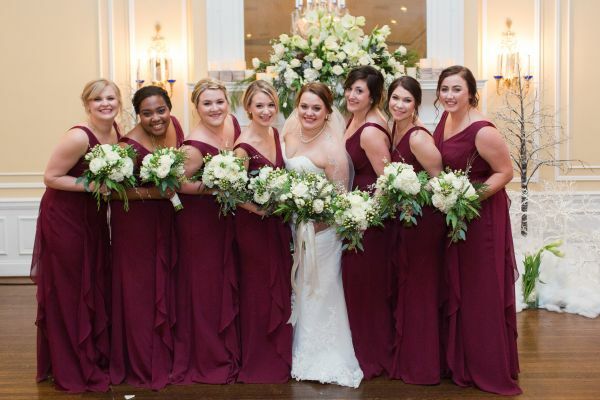 Make sure to see more of the Carlin wedding on page 74 of bridebook!